It's been nearly 20 years since Capcom released Resident Evil, but the company is still tweaking one of its best games. Thanks to some key control and graphical chances, today's re-release makes Resident Evil an even better and more enjoyable game than it's ever been. This latest version of Resident Evil is welcomed tweaking to an already great remake of an all-time gaming classic. Are you following? Resident Evil came out on the PlayStation in 1996. Capcom completely remade the game for the GameCube in 2003, which fans have lovingly dubbed REmake. What you can download today on various platforms is a better REmake. The game holds up spectacularly well, as it turns out. It's still scary, fun, and surprising. For Resident Evil diehards, there are some important changes made in this version. If you weren't playing games in the 90s, you might not remember tank controls, a movement scheme best left to history. In a nutshell, the orientation of a character needed to be rotated to move in a new direction. Pressing left didn't move the character, it turned the character left. If you wanted to move to the right, you had to turn the character to the right, then press up on the d-pad or analog stick. It was weird, but the cumbersome movement was part of the charm. Or was it? I'm not so sure. Purists can slowly lumber around all they want, but after a few hours with modernized controls, there's no going back. 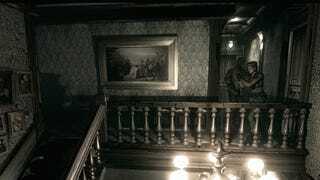 Being able to move the character where I want and when I want makes Resident Evil a more playable game. It's probably an easier one, too, but a few minutes with the tank controls was enough to convince me it was a worthy trade-off. It's not like updated controls removes all of the game's quirks, either. Since Resident Evil relies on fixed camera angles against pre-rendered backdrops, there are still plenty of instances where enemies are running around off-screen and you're unable to properly line up a shot. I finally turned the game off last night after a murderous, invisible dog took me out for the third time. Capcom's made some visual upgrades to this version, but it's not substantially different. It's possible to play the game in widescreen, even though Capcom's artists didn't actually re-render the backgrounds. To pull off widescreen, the game crops the backgrounds to make them fit. As the character moves around the screen, the rest of the backgrounds eventually become visible. Not a big difference. At least, not a deal breaker. Like tank controls, it's an option you can toggle at any time during the game. I moved between the two options during my first few hours, and eventually settled on widescreen. If you don't know what's missing, there's no real harm. The cropping hasn't had any meaningful impact on playing the game, and having the game take up the entire screen on my big TV looks incredible. When Resident Evil came out in 1996, I was 11-years-old. Even though it was an M-rated game, my parents let me pick up a copy for the original PlayStation. Flesh-eating zombies? I'd seen way worse in the movies. 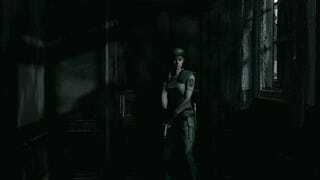 The original Resident Evil became a game I played over and over, and was quickly obsessed with Raccoon City and the evil experiments by the Umbrella Corporation. My friends weren't into games at the time. They were more interested in secretly burning the comics section of the newspaper behind a tree because it turned different colors. To be fair, it was pretty cool. But Resident Evil was different. Creepy and full of mysteries, my friends asked me to boot it up when school was over. And when I pointed a shotgun into the air, we all waited with baited breath to find out if this would be the bullet that caused a zombie's head to explode. These days, interest in Resident Evil has waned significantly. What is Resident Evil anymore? Resident Evil 4 was revelatory, a terrific sequel and soft reboot for a waning franchise. But Resident Evil 4 also started the series down an action-oriented path that had me parting ways during Resident Evil 5, a game I couldn't find the energy to finish after a frustrating swamp area. And after spending 20-plus mindless hours with Resident Evil 6, a tonal and mechanical mess of a game, it seemed Resident Evil wasn't for me anymore. Time to move on. There's hope in nostalgia, though, and replaying Resident Evil reminded me of its greatness. Bottom line, Resident Evil is well worth exploring again. I don't replay old games often, but I'll make time to see this adventure through. The future of Resident Evil be a piece for another day, but who wouldn't love another game like this? Resident Evil became preoccupied with upping the ante in every sequel, as franchises tend to do. Nearly 20 years later, Resident Evil's basic premise—lost in a mansion with zombies—holds up. It's simple, effective, and scary as hell.